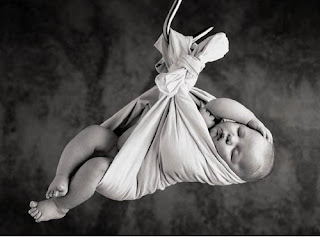 fabulous motherhood: When can my child sleep with a pillow? Should my toddler use a pillow, and if so, when? Though they're often sold with crib bedding sets, pillows are not recommended for children under 2. Kids that small can easily suffocate while using one. Actually, older kids don't need pillows either. Parents often think a pillow will provide their child with extra comfort, not realizing that their child was doing fine without it. If you want to introduce a pillow, it's best to wait until your toddler moves from a crib to a bed. But if you want to give him one while he's still sleeping in a crib, go with one that's small (the size of an airline pillow) and firm. Stay away from feather pillows, which are too soft, can set off allergies, and can smother a child if his head sinks into it while he's sleeping. Actually time lying down bfeedkan Adam,just wondering whether baby need to sleep with pillow or not..
sb tengokkan structure kepala and badan straight aje..Adam jarang tidur atas bantal dia..worry jgak takut effect ape2 plak kn..
so I got the answer..
hopefully during CNY sempat update..
Good info Nadia. Huspa letak pillow tapi pillow tu end up dekat kaki bobot je. mmg dia takkan tidur atas pillow. Adam pun nadia belikan Latex Infant Pillow,boleh elak baby suffocate..tp ma nadia selalu bising sb bantal tu nipis ngak..tp bila Adam besar bila time tidor,bantal ke mana,Adam pun kemana..
tp kalau bb nak jg kepala bg cantik,kn tiarapkan..tp nadia takut..
bolster,cot bedding semua behabuk dgn baby cot dia sekali berhabuk..haha..tk pakai..
exactly,mmg tak tidur bantak pun..tu yg nadia risau terus google cr info..